Our experience on residential and commercial units is exceptional. Maintenance packages bundles available. Call for details. Able Service Company takes this saying very seriously…We’re ready, We’re willing, We’re Able! 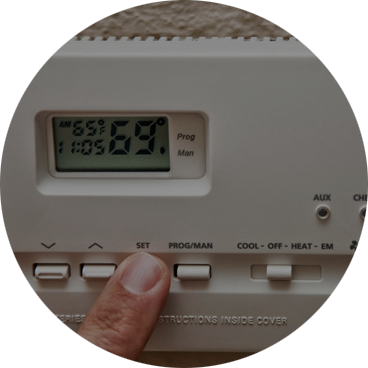 We are the leader in keeping your home at a comfortable temperature. 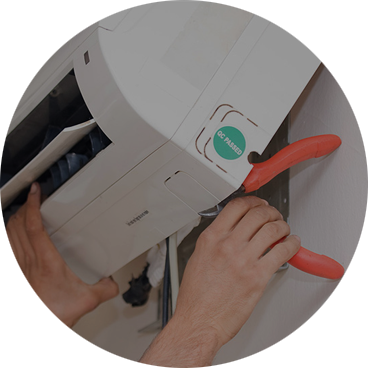 When it comes to repairing or replacing your heating or cooling system, we are the specialists you need to call. We're mobile friendly. Book your FREE Estimate from your mobile phone as you can on your computer. 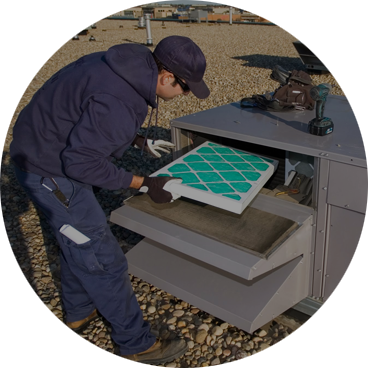 Quick, friendly service for our A/C unit fix. Called Able Service and told them that our A/C wasn’t blowing cool air, they scheduled a technician for THE NEXT MORNING! So that was a fantastic start. The gentleman who came out said he has been with company 18 years, and he didn’t act rushed or bothered to help explain what was wrong with the unit. Even gave me some tips on filters, vent placement, and programmed my thermostat. Very friendly and polite man. Also the price charged I felt was VERY reasonable. And we operate on a strict budget so that is saying something. He had to change out the capacitor for our unit and explained why and what to look for in the future, etc for our unit. Definitely using this service again if needed!!! I spoke to Rita for almost 20 minutes prior to scheduling an appointment. She was knowledgeable. friendly, and willing to discuss possible issues over the phone. Every person I encountered at Able was empathetic and professional. A refreshing experience on a hot day when no other HVAC company could be bothered to have a conversation about my situation…not even the company with my annual service contract…thanks again Able. Very prompt, told us what the problem was immediately, and fixed it. Our AC stopped blowing cold yesterday and we were dying in the house all night. First thing this morning I started making calls and researching online for a good place to call. After reading the great reviews of this place I decided to call them. After talking to the one guy for a few minutes and talking it over with my husband and telling him what they said we decided to have them come out. I was worried it would be late this afternoon when they got here. It was literally less than two hours later when Alex called to ask if he could come on over. My husband talked to him and watched as Alex worked to find out what was wrong. Within 10 minutes he had a guess as to what might be wrong. He offered to try it and see if that was the problem and said if it wasn’t and it was the compressor he would take the part out and just charge the service fee. Fortunately it was this minor part and within the hour the house was cooled off again. Alex was very upfront and honest and explained everything to my husband and gave him lots of tips to keep it running well. He even offered to show him exactly how to fix the issue and only charge the service fee. My husband declined and had him do it for us and it was cheaper than what we had thought it would be. And the best part was because it was still two days away from payday we didn’t have all the money so they agreed to take a post dated check. We are so pleased with the experience and will definitely use them again if the need arrives. Thanks so much. Oh and their price for the sr22 freon which is the older kind that is harder to find was $30 cheaper than most other places. If you have an older unit it probably takes the sr22 this place will definitely save you money. Called and spoke to Rita who dispatched Alex to our house the same morning. Alex was very knowledgeable and had the repair to our furnace completed quickly. He explained the problem and the fix and did it all for a very fair price. He even added a recommended piece of PVC to the drain pipe and explained another aspect of the installation that was now out of code (to make us aware in case of future inspections). Definitely recommend! Very professional and courteous. Polite. Would recommend and hire again. Rita as customer service excellent. Really listened and understood my issue and gave great detailed suggestions really went the extra mile. No pressure what so ever to get me hooked on something. True customer service. Alex the tech outstanding excellent really detailed and went step by step with me on everything he was performing. Also went the extra mile no rush to be in and out. This is what excellent service is from start to finish at really reasonable pricing and no peer pressure. Would really recommend. My family thanks them for coming out last minute and fixing our furnace.!!! I would use them again. They kept me informed throughout the whole process. Very polite and respectful in my house. ASC arrived on time, focused on the issue, discovered the problem quickly, resolved the issue, found a discrepancy from a previous (formidable installer), explained the details so that I could understand, prepared a LEGIBLE invoice, and charged a fair price. I recommend them highly! Very professional, very friendly. I’m very happy! The owner Lewis is very helpful and wants to make sure his clients stay within budget. He is polite and very professional. The technician was prompt, friendly and was able to explain the available options to me. Scheduling an appointment was easy and timely. Jared came and provided great service. 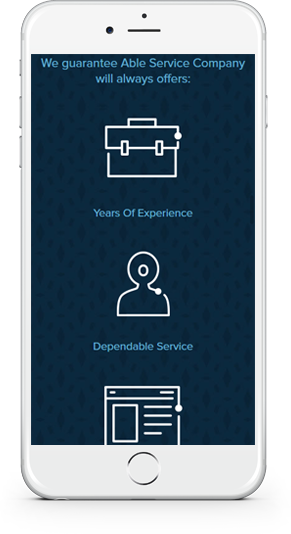 We called 3 other companies and found Abel to be the company that provided the fastest service. AC broke- ASC was at my house in under an hour. Technician (Alex) was great. My AC is not worth the repair- so we are waiting on a quote to replace entire AC in house- furnace, coils, 2 units etc.. Fast, courteous, informative. Thank you. Don’t allow cost to interfere with your comfort, we are here to help. Over 30 years of making a difference in people’s lives. We are available during regular business hours. After hours and holiday’s have an additional fee. For over 30 years, you can trust we know our business, with awards to show for it. No job is too big or too small, we handle it all. Contact us today. We’re ready, We’re willing, We’re Able!